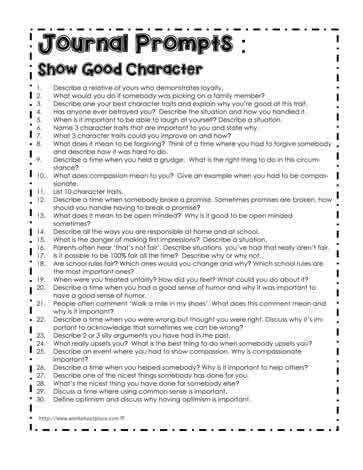 These journal prompts support developing good character. Sometimes students don't often know what to write in their journals. When using these journal prompts, you are helping to promote a good understanding of character traits. These good character journal prompts can be used in grades 1 to 3. Each week, have a different character trait to focus on and have students write in their journal. For instance, if you focus on honesty, students can write about when they demonstrated honesty or when a good friend of their demonstrated honesty and explain why and how honesty occurred. Journal prompts are a great way to stimulate thought in writing.